Brian Niemeier brings the same otherworldly imagination from his award-winning Soul Cycle to the mecha genre, creating an homage to Gundam and Tom Clancy. At a time where military science fiction has ossified into space marine wars of attrition and Horatio Hornblower battles in space, Combat Frame XSeed offers instead an espionage thriller where raids and revelations change the histories of entire nations. Sieg Friedlander’s failed rescue of his sister sparks a conflagration of intrigue and war that engulfs the solar system many times over as he seeks revenge against Director Sanzen for killing his sister. Along the way, Sieg finds allies in Tod Ritter, a noble fighting to free Neue Deutschland from Coalition control, and Zane Dellister, a Coalition deserter who is obsessed with the advanced combat frame prototype he’s stolen. But the Coalition is not a united front, and as Director Sanzen tightens his control over Earth, factions in his government seek their own purposes at his expense. The result is a whirling mix of shifting alliances, betrayals, and revelations as secret histories are hinted at and revealed. I've long respected Nathan as a critic because he has deep and broad knowledge of science fiction, he doesn't play favorites, and he consistently offers useful criticism; not fannish fawning or trollish heckling. He's never hesitated to point out flaws in my previous books, so his rave review of Combat Frame XSeed leaves me genuinely humbled. I wrote CFXS as a reward to my readers for sticking with me. Based on the book's overwhelmingly positive reception, they would appear to be pleased. The action is warband against warband and champion against champion, as men and machines clash over issues of freedom and revenge. This feudal approach adds to the thriller’s twists and turns by allowing Sieg, Tod, and Zane a freedom of action not found under strict military discipline. The result takes the best portions of Stephen Lawhead’s Arthur and C. S. Friedman’s In Conquest Born and lets them run loose with giant robots. After finishing 6th in the Campbells behind No Award, seeing a serious critic favorably compare my novel to the book that made Campbell winner C. S. Friedman's career feels pretty vindicating. What are you waiting for? 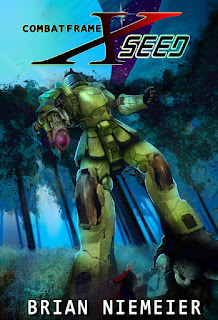 Pick up Combat Frame XSeed today! Got my copy in yesterday. Can't wait to read it!